Rusty threw me an awesome birthday party this year. We went down to the tennis courts by the community center and taught all our friends how to play nerfis. Everyone loved it, and we need to do it again soon. It got dark a lot more quickly than we would have liked, so we ate cake and snacks in the complete pitch black. Thanks to everyone for coming! There is only one pic of me, and my mouth is full of cake, so I don’t think I’m going to post it. You’ll just have to imagine how great I look. We also had a very fun FHE last night. Last weekend Sara and I went out to dinner and then to Women’s Conference at her Stake Center. 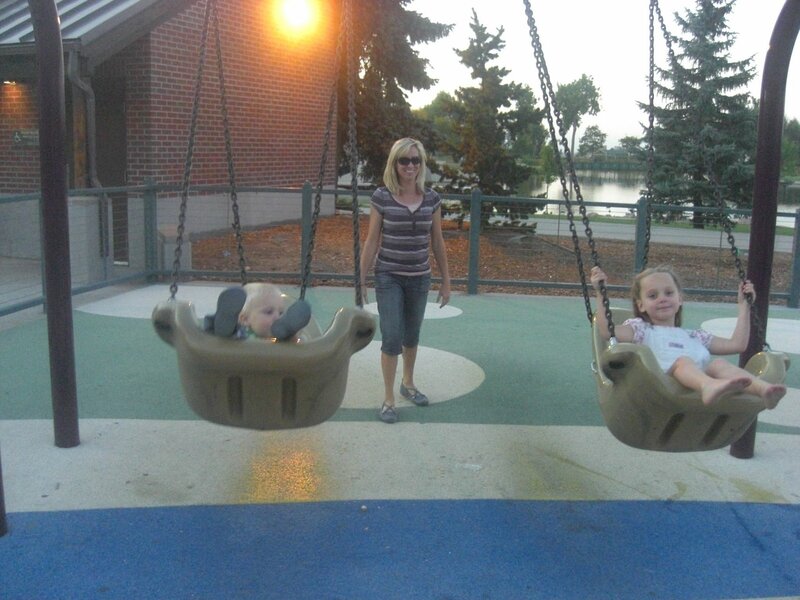 (It was also awesome to have a girls night away from the kids) Well, on our way we passed this awesome park I’d never seen before. It had a cute lake and a huge playground. So for FHE last night we packed up a picnic and headed over. The kids loved wading in the freezing lake and feeding the ducks. 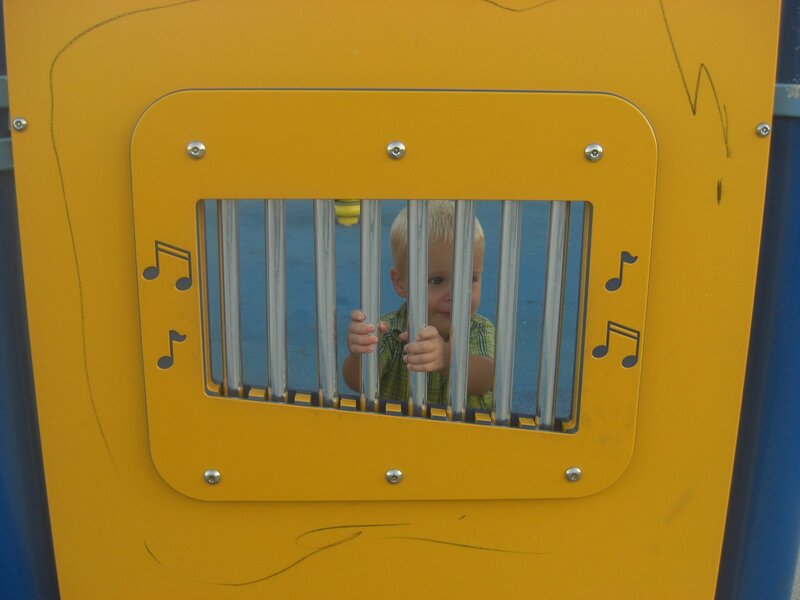 Josh is obsessed with music right now, so his favorite part was the “piano” (see pic below). 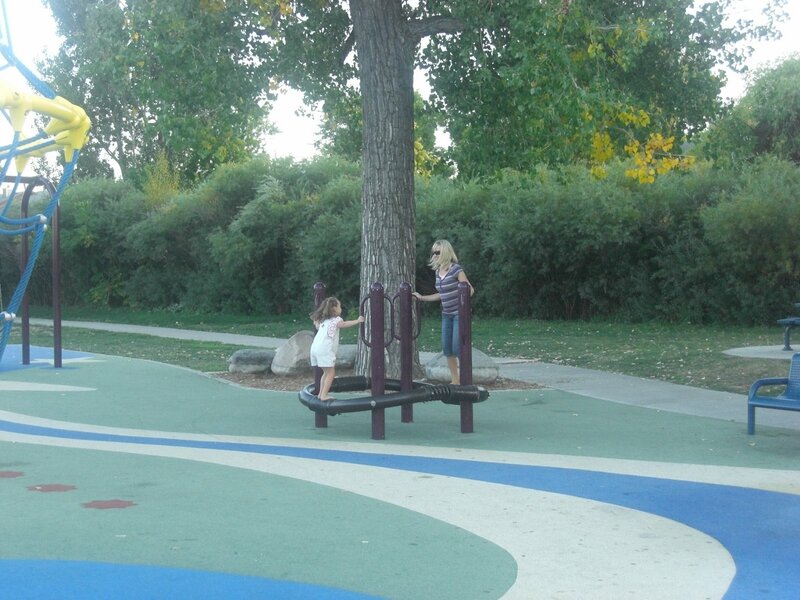 Halle’s favorite part was playing on the swings. It’s amazing that you can live somewhere 3 years, drive very near this park A LOT, and not even know it exists. So if anyone is needing a change of scenery let me know. September 30, 2008 in Uncategorized. Tara! Happy Birthday! Good ol’ nerfis. Good times!Looks like you guys are doing good. Congrats on the marathon. That is awesome! I want to do that some day. (okay, maybe not really, but you’re so inspiring.:)PS. It was really hard not to cry watching the pictures and reading the post about your friends loss of her sweet baby. I can’t imagine. Knowing that things like that happen makes me so grateful to have the knowledge of the gospel.We miss you guys! Hey, I’m having trouble posting the ‘Recent Visitors’ Feed onto my blog… Any ideas why? I love it! -It’s the best one I’ve seen. Nevermind! I forgot that I have to follow special instructions because my blog is private. I’ll figure it out! Sorry! happy late birthday you old fart! Like I should talk 🙂 At least you don’t look a day over 19! Happy, Happy Birthday Tara!! Hope you had a great day. I sure am glad I’m not as old as you 🙂 I miss nurf tennis, I’m jealous. We’ll have to play next time you’re in St George, or maybe AF. Hey old lady! Just kidding. I’m almost there myself. Sorry I didn’t call on your b-day. I forget my own siblings birthdays lately! Anyway, I’m glad it was a good one. I sure miss you! You are my favorite 27 year old! Love ya lots. happy birthday Tara, sounds like Rusty knows how to surprise. I love finding new parks!!! Happy Birthday to you! Sounds like a fun celebration! P.S. DID YOU SEE ALL THE NEW PEOPLE ON BLOG FROG? OHHH YAH! SEE HOW FRIGGIN COOL i AM! I AM IN CHARGE OF THE CLASS OF 1997’S MYSPACE PAGE AND I TOLD EVERYONE TO BLOG FROG OR DIE! I saw you on Seriously So Blessed. That’s awesome. Great advertisment:)But, I can’t get the ‘Recent Visitors’ to work. I’ve made my blog public to do it and it still doesn’t work. Any ideas? Love the blog frog! Thanks! Wow, it’s been a while. Great to hear from you guys. Happy Bday Tara! You have very cute kids!